This year's class includes (front row, from left) Jacklyn Watt, Ford; Jill Phillips Ortega, GM; Jordan Davis, Columbus Partnership; Shilpa Patel, Faurecia; Tricia Batoha, FCA; Jennifer Haroon, Nauto; Jamie Zinser, Dura; Terri Von Lehmden, Toyota; (back row, from left) Carl Beckwith, Dana; Joseph Conley, Ford; Steve Gawronski, Rivian; Christopher Baranick, International Automotive Components; Jessica LaFond, FCA; Jon Husby, SEG Automotive; Nick Sitarski, Toyota; Andrew Franceschini, Hyundai. 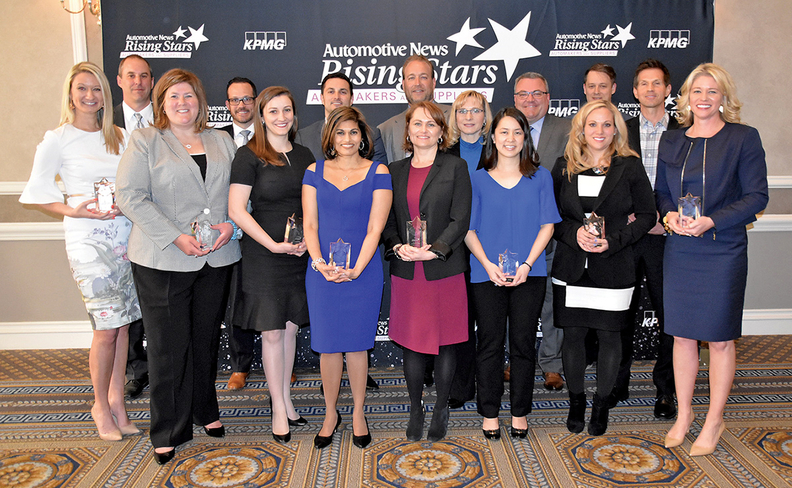 Automotive News honored a new generation of leaders on the manufacturing and supplier side of the industry at its 2019 Rising Stars luncheon last week at the Detroit Athletic Club. For profiles of the winners and more photos from the event, go to autonews.com/risingstars. 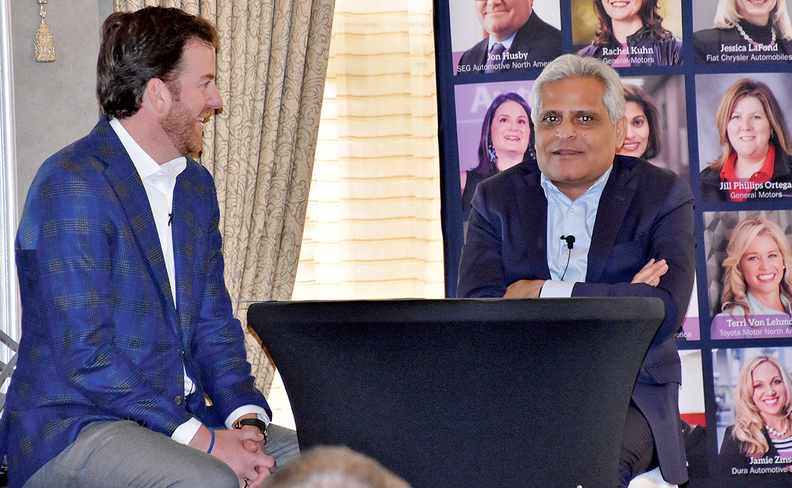 Kumar Galhotra, right, Ford's president for North America, tells Automotive News Group Publisher KC Crain about how he got an interview at Ford only because his resume was placed in the wrong pile. Automotive News Publisher Jason Stein, at podium, invites applause for the honorees. 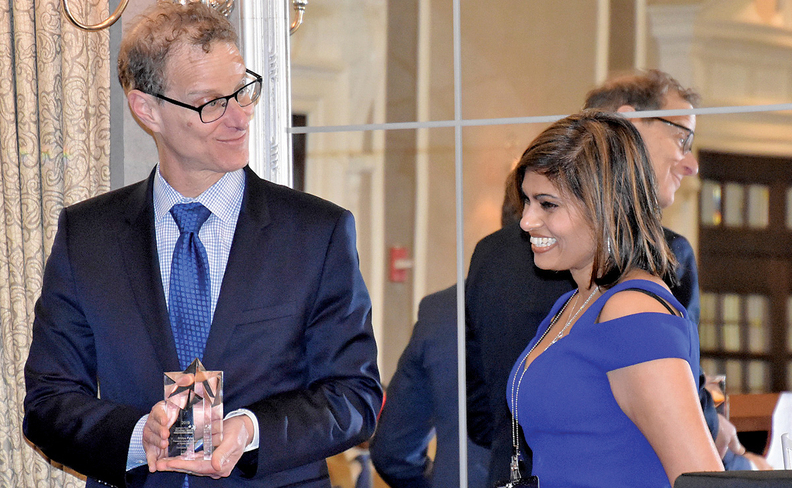 Gary Silberg, Americas head of automotive for Rising Stars sponsor KPMG, presents a trophy to Shilpa Patel, regional purchasing director for Faurecia. Patel’s father strove to foster a strong work ethic by requiring her to work in a factory when she was 16.